The night lighting of modern urban civilization has completely obliterated the natural glory of a star-filled night for most Canadians. It is now a fact of life that the only time many city or town dwellers ever see the stars is while on vacation in "cottage country". However, even there, local lights at night are now so pervasive that the stars are being beaten back ever farther into the wilderness. In a period in our history when unprecedented knowledge is being gathered by space probes and orbital telescopes, it is ironic that the average person has essentially lost the opportunity to simply look up at the night sky and experience the vastness of space. This is why the concept of a Dark-Sky Preserve is an idea whose time has come. Few natural vistas can match the inspirational panorama of the Milky Way - our home galaxy - arching overhead on a cool, clear summer or early-autumn evening. At the Torrance Barrens, the ancient constellations and planets shine forth in majestic profusion. On occasion, the northern lights (aurora borealis) are visible - often as greenish wisps but sometimes as spectacular curtains of colour. In binoculars, rivers of stars that are completely invisible to the naked eye flow into view. Rich star clusters, wispy nebulas, the cloud banks of Jupiter and the rings of Saturn are all visible with a beginner's telescope. A dark-sky island like the Torrance Barrens is the only place to properly see other galaxies so remote that the light from their stars takes millions of years to reach Earth. Light from these entities is so delicate that complete darkness is necessary to view it in a telescope. The Andromeda Galaxy (two million light-years away) is the nearest galaxy that can be seen from Canada and is faintly visible to the naked eye from the Torrance Barrens. In binoculars, Andromeda is an unforgettable sight. 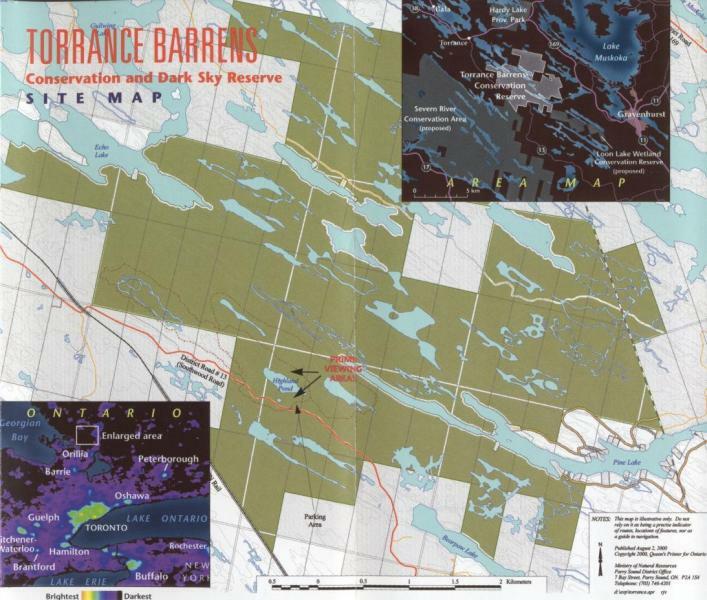 The Torrance Barrens is 1,905 hectares (4,707 acres). The geology of the landscape is characterized by low ridges of Precambrian Shield, which formed approximately 2.5 billion years ago. The most recent major event to visit these original ridges was the scouring and washing away of soils by the glaciation of the last ice age, 12,000 to 20,000 years ago. Some of the remnants of these soils have accumulated on the lower slopes, producing a mosaic of vegetation that can survive in hot, dry conditions. Typically, red and white oak, white pine, aspen, white birch and red maple may grow as scattered individuals or in clumps. Where the soil has been stripped entirely, myriad lichen and moss species carpet the bedrock. The troughs between the rock ridges are filled with wetlands and small ponds and lakes. The wetlands are diverse, with dense open-water marshes, peatlands, grassy bog mats, floating shrub mats and swamps dominated by mature conifer trees or shrub thickets. Beavers are active in many wetlands. 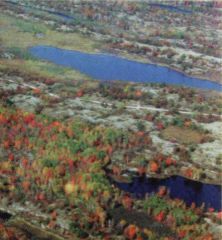 The rich variety of vegetation, the geology and the large size of the Barrens have resulted in a diversity of plants and animals, including some provincially and nationally rare species such as the Southern Bog Lemming and the elusive Five Lined Skink, Ontario's only lizard. One might also find the threatened Eastern Massasauga Rattlesnake, the uncommon Eastern Hognose Snake and several species of birds and mammals that are at the northern limit of their distribution. The Township of Muskoka Lakes Recreational Trails Committee has created several trails suitable for educational and interpretive hikes as well as family exploring. The trails are accessible from the parking area at Highland Pond off District Road 1 3. There is excellent blueberry picking in the summer, and a main snowmobile trail runs through the area in the winter. Access to the Torrance Barrens is off District Road 13 (Southwood Road). If you are coming north on Highway 11, turn west onto District Road 13 (between Gravenhurst and Washago), then drive about 20 minutes until you see the brown Torrance Barrens sign on your right. Parking is in the area to the left of the sign. An alternate route is to turn south onto District Road 13 from the village of Torrance on view the larger map here (200k). it is easily accessible by road and is just a two- to-three-hour drive from Toronto, Hamilton, Oshawa and other large-population centres. This combination of attributes makes the Barrens unique in Ontario. 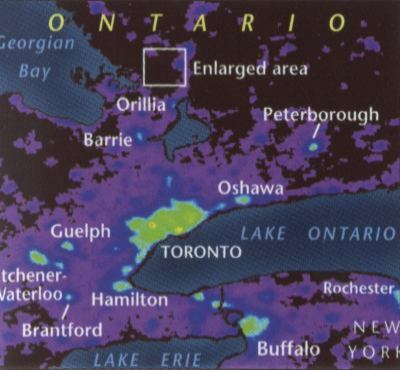 In 1999, the Ontario government acknowledged night-sky viewing as an important use of the Torrance Barrens and added the designation of Dark-Sky Preserve to its title. The announcement received national and international attention. This is indeed a special place to view the universe. The metamorphosed rock is more than two billion years old. It has been under mountains, under water, under miles of ice and under tropical jungles many times in its history. Today, it is under your feet as you look up into the cosmos and appreciate the immensity of time and space. The observing area is on the smooth granite outcrop immediately behind the Ministry sign on Southwood Road. It is accessible to vehicles to allow easy unloading of telescopes and astrophotography gear. This is the prime viewing area. For unsurpassed binocular viewing with a fully unobstructed 360-degree panorama, walk along the main trail (follow signs), across the boardwalk and up the first ridge. Take in the Reserve's natural wonders both below and above you. There are no official campsites, but limited camping is permitted. If you live or work in this area, keep the Barrens dark for ourselves and for future generations by limiting your use of artificial light at night. Please leave no litter or debris. And remember to help preserve the Torrance Barrens as a place "where people may frequent but do not remain. 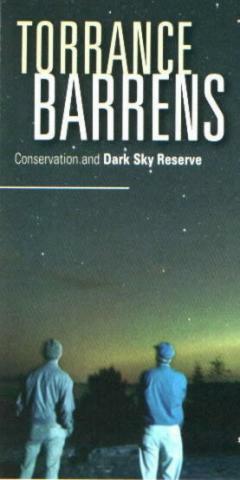 Taking advantage of the goals of provincial parks can expedite the promotion and nomination of Dark-Sky Preserves. 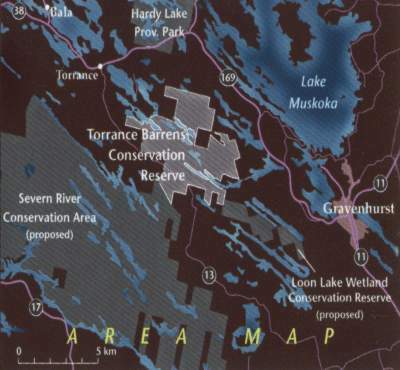 This document is from the Ontario Government and outlines the rationale for the designation of the area as a Conservation area and Dark-Sky Reserve under the definitions of the Ontario Ministry of Natural Resources. We feel it will be helpful for others.